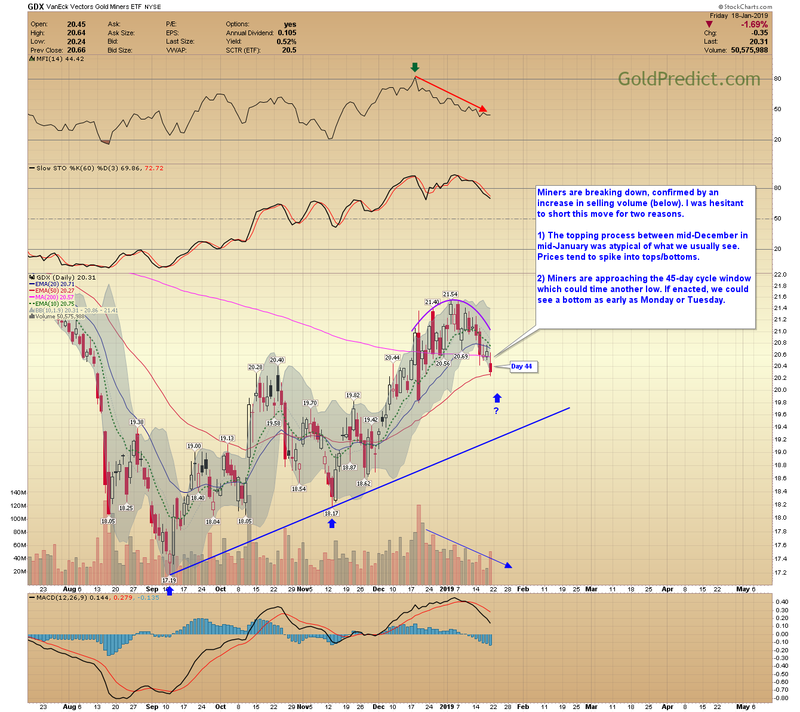 Big picture time for gold. It’s easy to get lost in the daily and weekly gyrations and lose sight of the broader perspective. 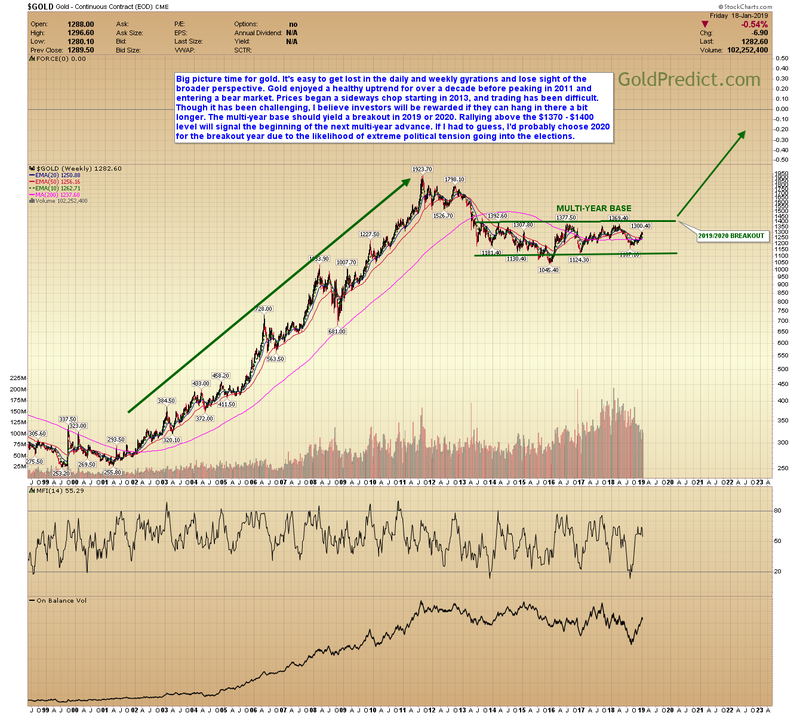 Gold enjoyed a healthy uptrend for over a decade before peaking in 2011 and entering a bear market. Prices began a sideways chop starting in 2013, and trading has been difficult. Though it has been challenging, I believe investors will be rewarded if they can hang in there a bit longer. The multi-year base should yield a breakout in 2019 or 2020. 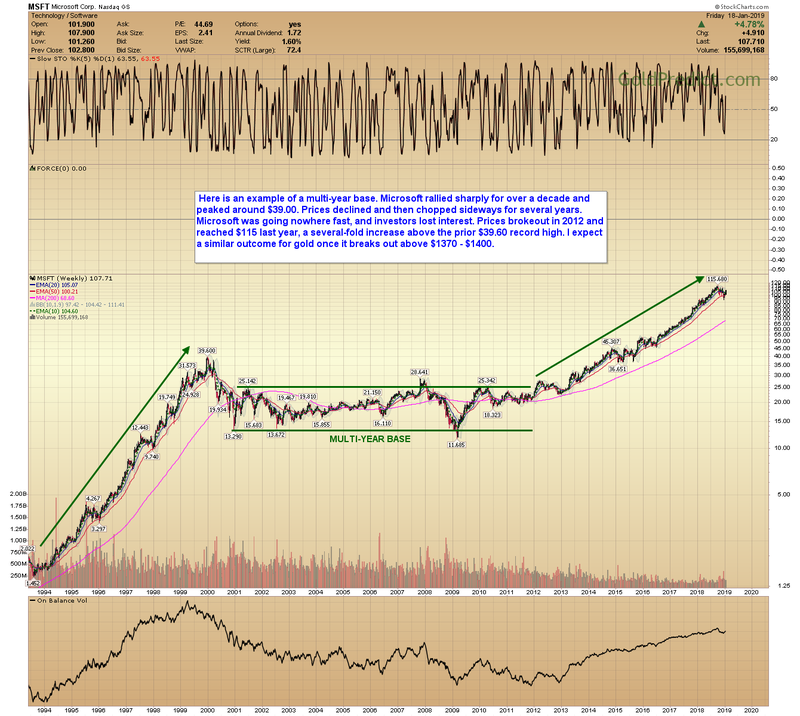 Rallying above the $1370 – $1400 level will signal the beginning of the next multi-year advance. If I had to guess, I’d probably choose 2020 for the breakout year due to the likelihood of extreme political tension going into the elections. -MICROSOFT’S MULTI-YEAR BASE- Here is an example of a multi-year base. Microsoft rallied sharply for over a decade and peaked around $39.00. Prices declined and then chopped sideways for several years. They remained elevated and towards the top of the range before breaking out in 2012. Last year prices reach the hundred $115, a several-fold increase above the prior $39.60 record high. 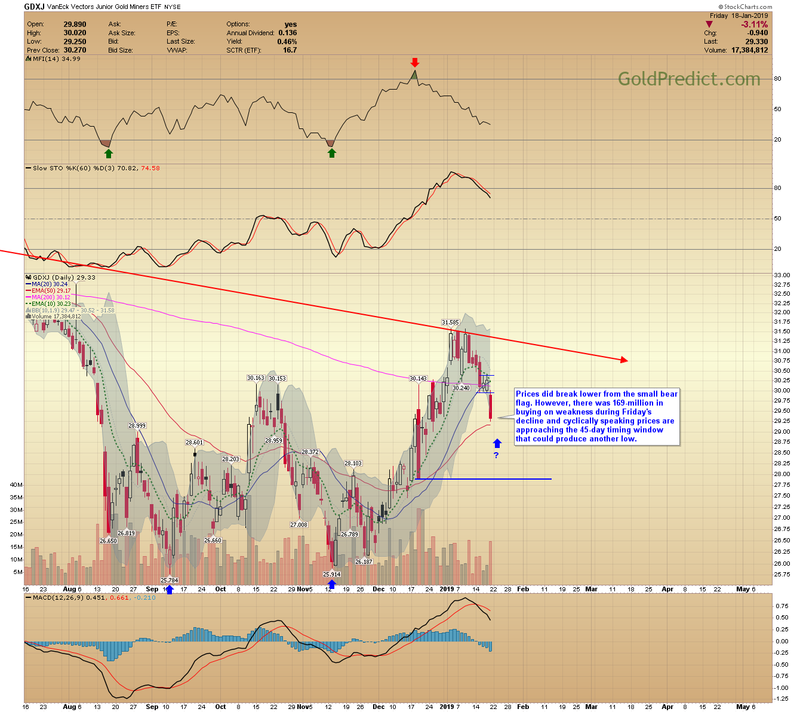 I expect a similar breakout and advance for gold. 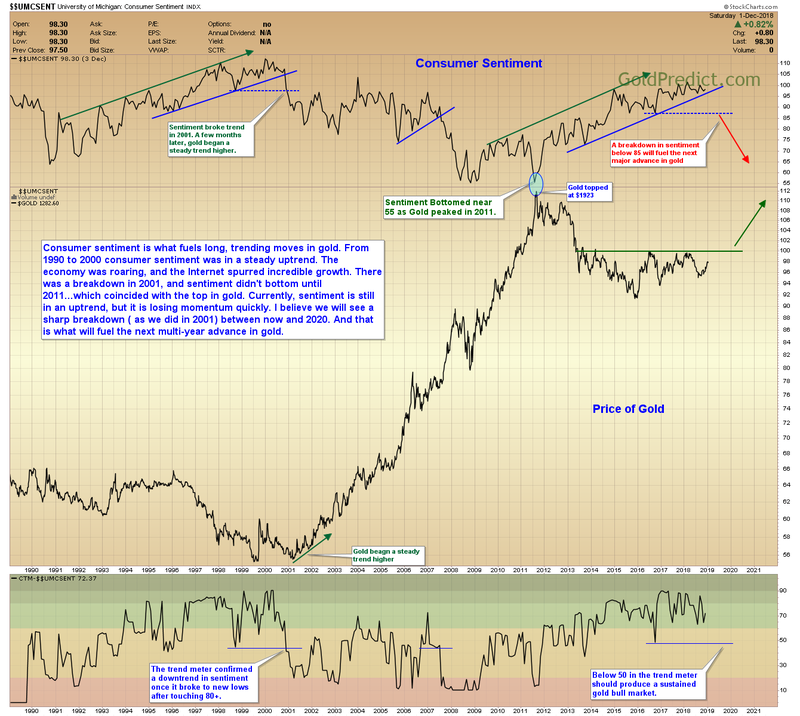 -CONSUMER SENTIMENT- Consumer sentiment is what fuels long, trending moves in gold. From 1990 to 2000 consumer sentiment was in a steady uptrend. The economy was roaring, and the Internet spurred incredible growth. 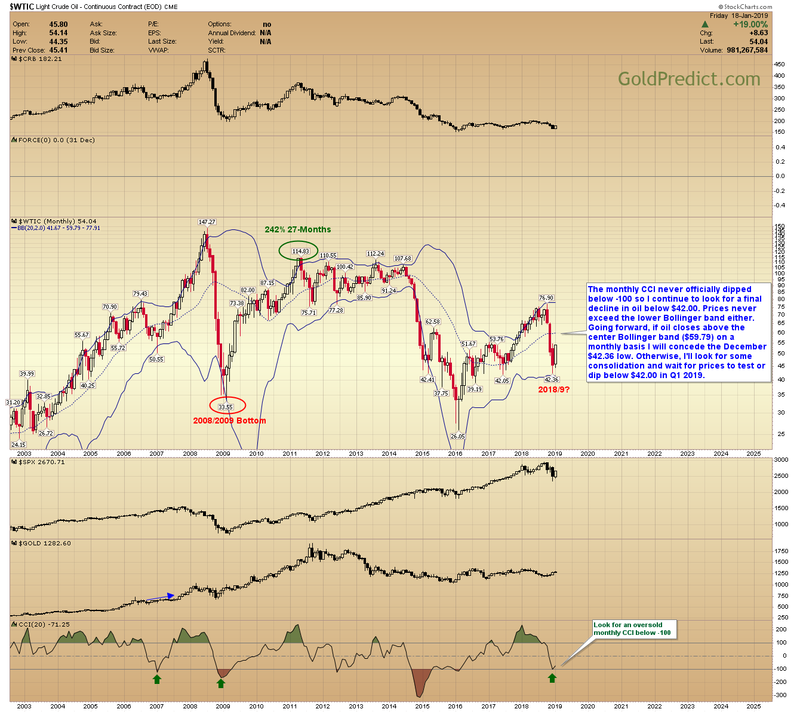 There was a breakdown in 2001, and sentiment didn’t bottom until 2011…which coincided with the top in gold. Currently, sentiment is still in an uptrend, but it is losing momentum quickly. I believe we will see a sharp breakdown (as we did in 2001) between now and 2020. And that is what will fuel the next multi-year advance in gold. -GOLD DAILY- Near-term, gold broke slightly lower and closed below the 10-day EMA. However, it is yet to form an official swing high until prices close below $1278, so I still can’t confirm a cycle top. Nevertheless, the 6-month cycle is mature at 22-weeks, and that should produce a multi-week correction, at some point. -GOLD WEEKLY- The previous 6-month cycle bottomed 22-weeks ago, prices should be nearing the declining phase of this cycle. 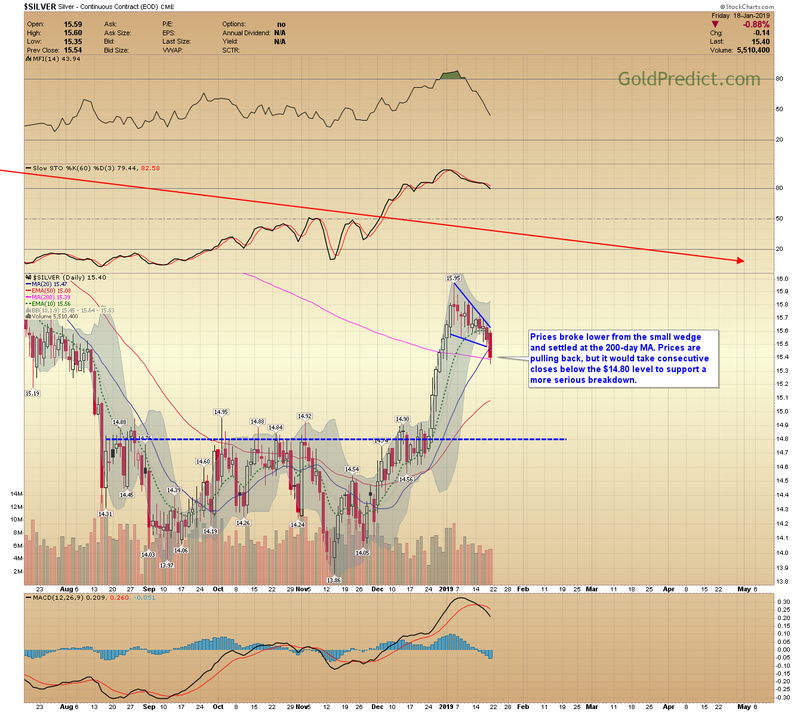 On a weekly basis Gold still needs to close below $1278 to sponsor an intermediate top. 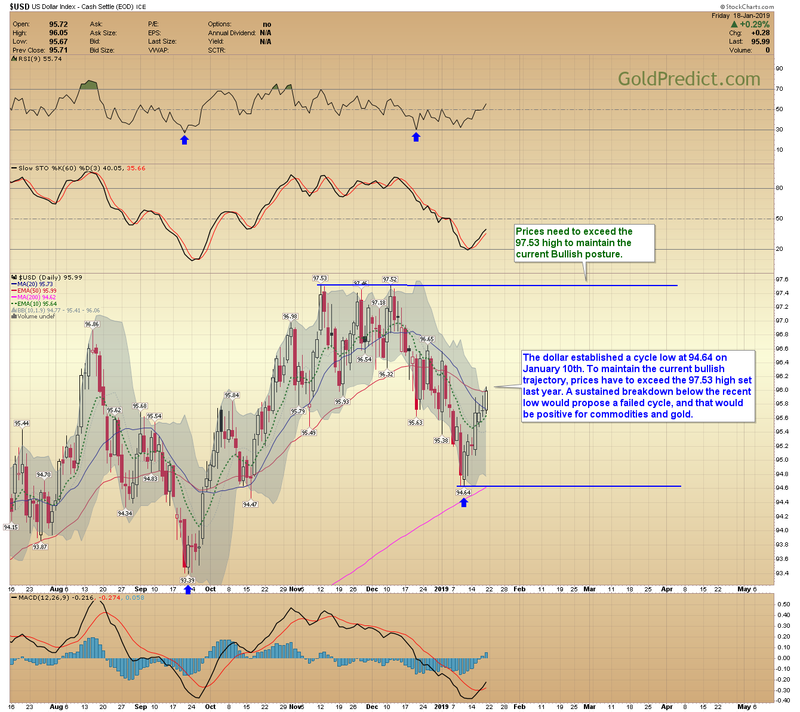 Until consumer sentiment breaks down gold will likely remain in a range. I’ll use dips below the 200-week MA as an opportunity to add to my core positions. To me, buying gold below the 200-week MA is like buying Microsoft below $20.00 just before it’s 2012 breakout. -US DOLLAR- The dollar established a cycle low at 94.64 on January 10th. To maintain the current bullish trajectory, prices have to exceed the 97.53 high set last year. A sustained breakdown below the recent low would propose a failed cycle, and that would be positive for commodities and gold. -SILVER- Prices broke lower from the small wedge and settled at the 200-day MA. Prices are pulling back, but it would take consecutive closes below the $14.80 level to support a more serious breakdown. -GDX- Miners are breaking down, confirmed by an increase in selling volume (below). I was hesitant to short this move for two reasons. 1) The topping process between mid-December in mid-January was atypical of what we usually see. Prices tend to spike into tops/bottoms. 2) Miners are approaching the 45-day cycle window which could time another low. If enacted, we could see a bottom as early as Monday or Tuesday. -GDXJ- Prices did break lower from the small bear flag. However, there was 169-million in buying on weakness during Friday’s decline and cyclically speaking prices are approaching the 45-day timing window for a potential low. -SPY- Stocks continue to rally, and prices are coming into resistance between the trendline as well as the 200-day MA. Ultimate resistance resides at 280. -OIL MONTHLY- The monthly CCI never officially dipped below -100 so I continue to look for a final decline in oil below $42.00. Prices never exceed the lower Bollinger band either. Going forward, if oil closes above the center Bollinger band ($59.79) on a monthly basis I will concede the December $42.36 low. Otherwise, I’ll look for some consolidation and wait for prices to test or dip below $42.00 in Q1 2019. Other than the massive upswing in 2016, metals and miners haven’t gone much of anywhere for 2-years. Sure, they have a 1-2 month surge here or a 1-3 month decline there, but honestly, there is no trend. Remember the old saying “the trend is your friend” well – there is no trend. The 200-day MA’s are pointing mostly lower in metals and miners. That favors lower prices, so I’ve leaned slightly bearish of late. 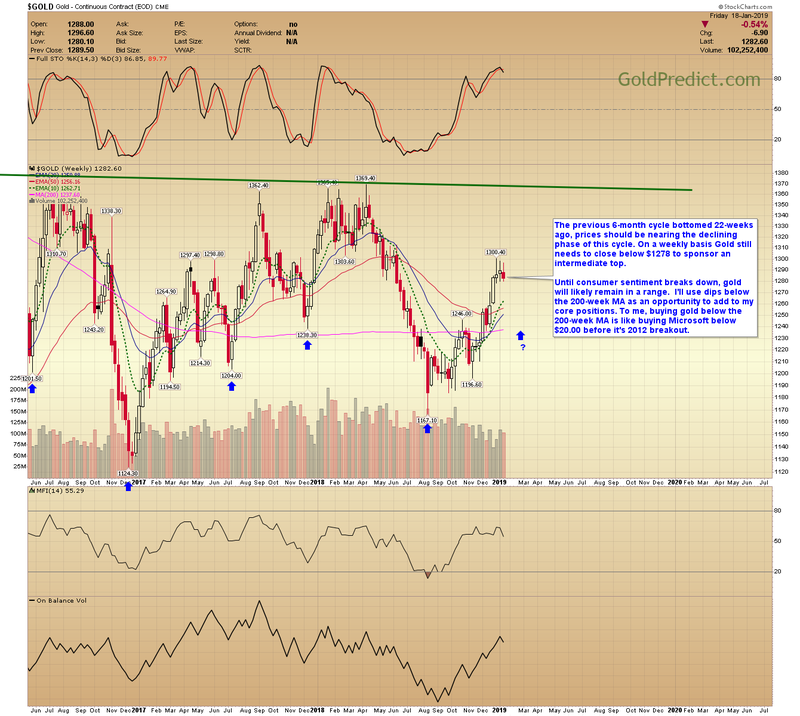 Especially, since gold had a chance to breakout above $1370 last April and couldn’t. Consequently, we could be stuck with more consolidation and choppy price behavior in 2019. However, I continue to view lower prices as a gift (like Microsoft below $20.00) knowing that in the not too distant future consumer sentiment will rollover and start another multi-year downtrend. That turn in sentiment should coincide with everyday citizens procuring gold as more and more lose faith in their elected officials. A fundamental and psychological shift will guide the transfer from paper and government assets (first bonds, and later the US dollar) to tangible assets (commodities) in 2019 or 2020. 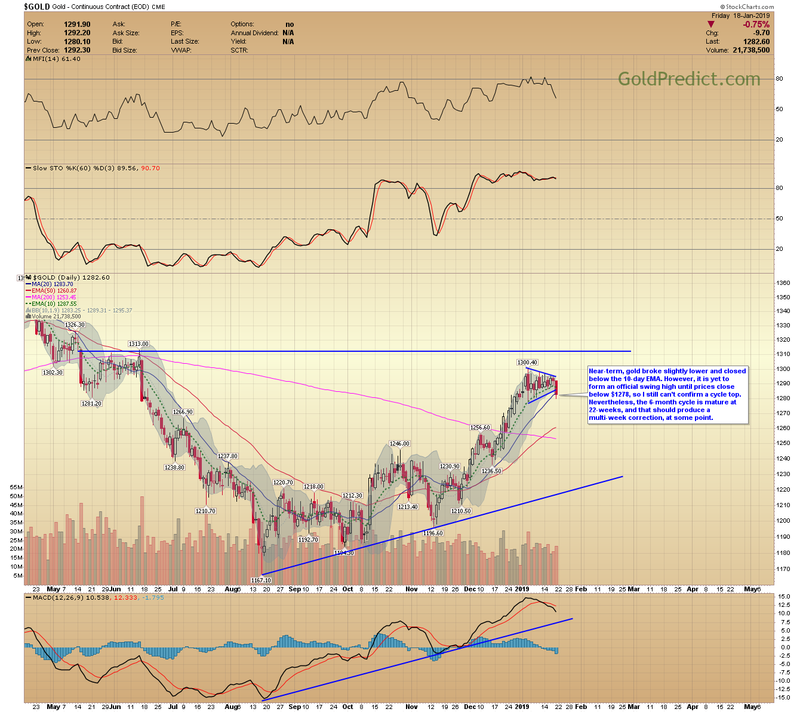 At that time we should see gold breakout above $1370 and begin to trend. In the meantime, I’m using this opportunity to accumulate more physical. Platinum is cheap, and I like silver as well. If miners drop to fresh lows, I’ll consider adding long-term positions expecting an incredible bull market into 2024-2025 (the next major 16-year low in the dollar). Often the most trying times in our lives propel us into our greatest increase. That’s been my experience anyway. 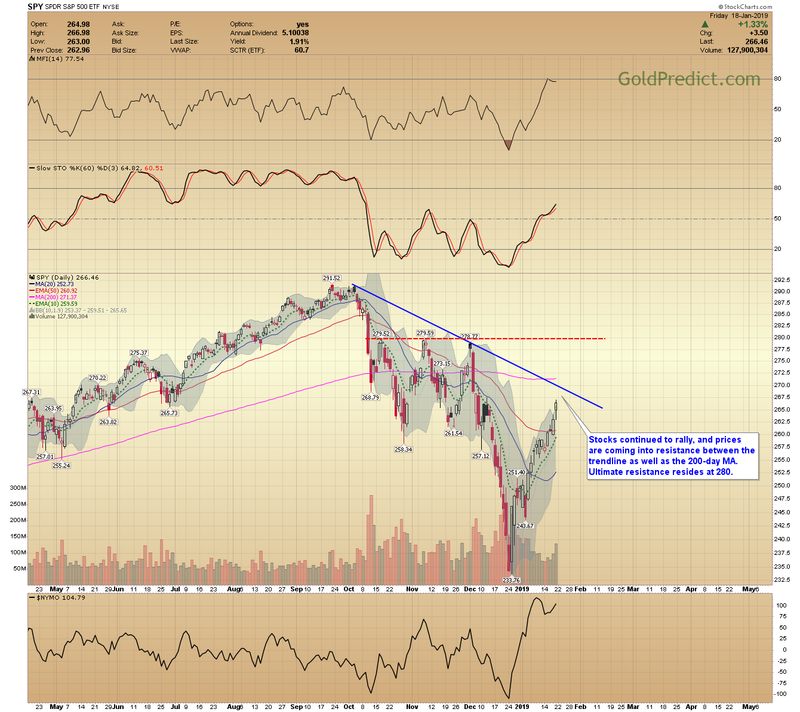 Stay the course, and I think this drawn-out basing phase will launch gold into its next major advance. And with any luck, we will get a “Bitcoin” type parabolic bubble. If that happens, there’s no telling how high prices could go.